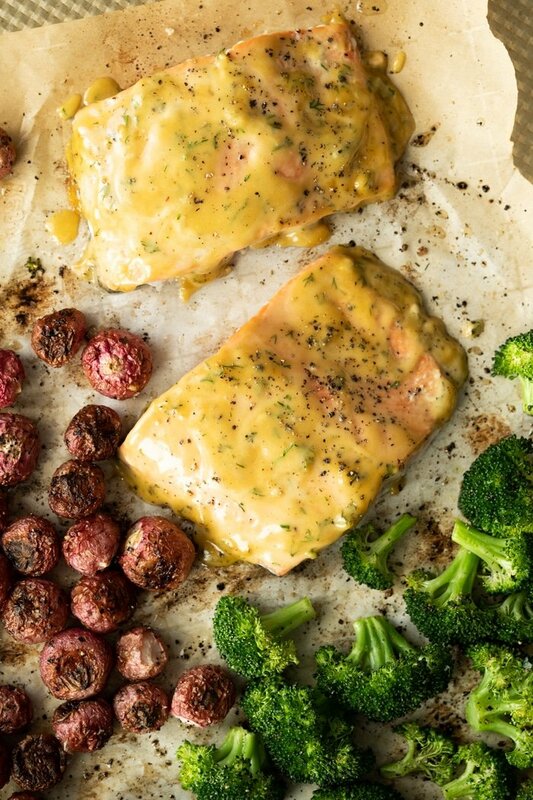 Bursting with flavor, this keto honey mustard salmon sheet pan dinner is bound to become a favorite. 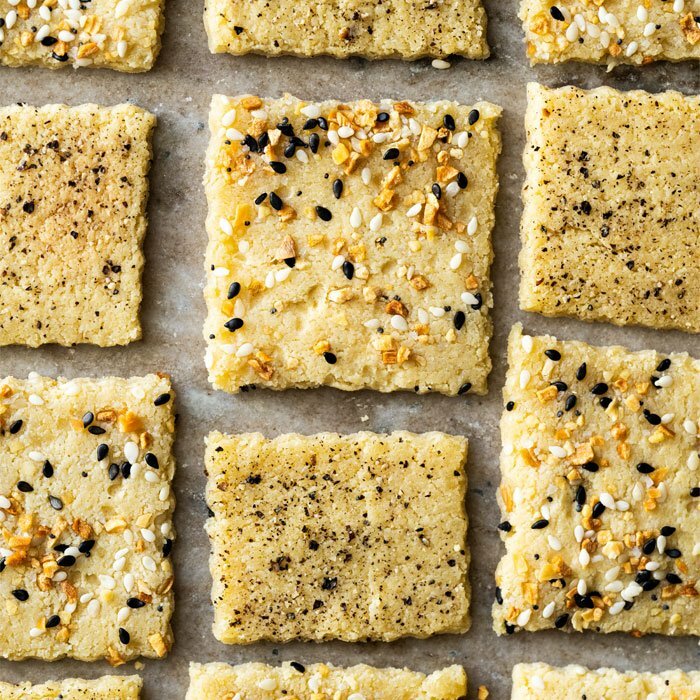 Expect perfectly flaky and delicious results in under 30 minutes! 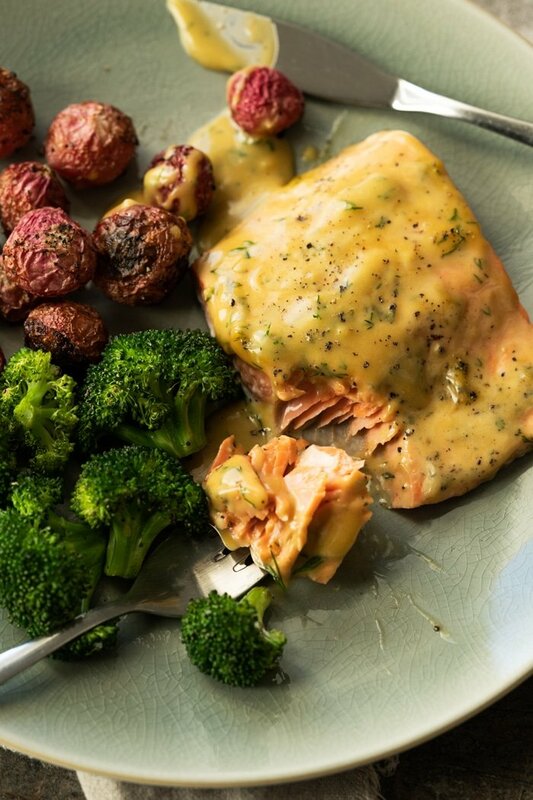 This keto honey-mustard sauce might just be one of my favorite salmon pairings (ever). It’s ridiculously simple to whip up, yet still feels rather fancy and special. Plus, it makes awesome leftovers (think a honey-mustard salmon salad for lunch!). And the sauce, of course, works beautifully with some smoked salmon too (!!). I’m also going to highly (highly!) suggest that you make extra sauce and keep it handy for quick salads (i.e. dressing!) or even a quick honey-mustard chicken situation. p.s. you definitely want to pair it up with our classic roasted radishes (i.e. ‘potatoes’!). Just leave out the parmesan for this dish, no need. p.s. numero dos! I’m also going to (again highly!) 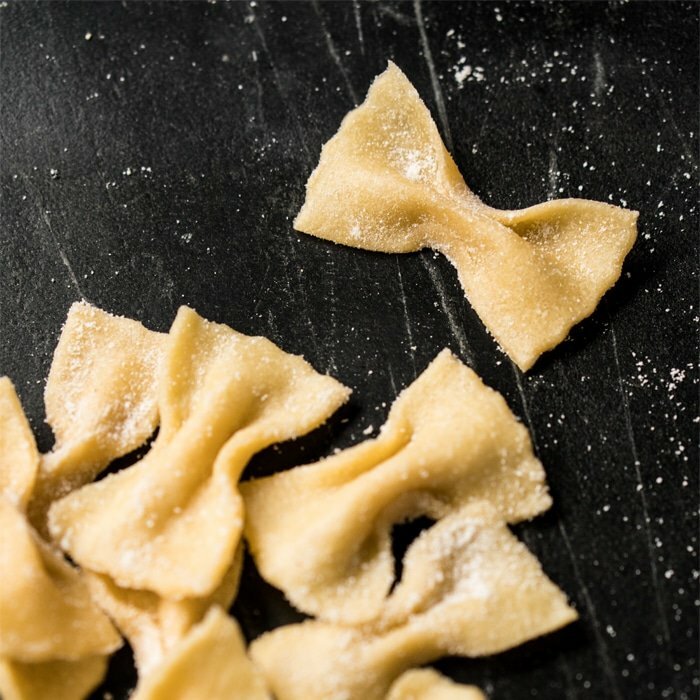 suggest you guys check out ButcherBox and their terrific product offerings: grass-fed and finished beef, organic chicken, heritage pork… and the latest is wild Alaskan sockeye salmon. Plus! They’re currently giving you guys 2lbs completely free (worth $39!) with your first box (offer ends this week). And nope, this is not a sponsored post. 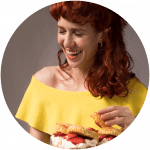 But I do love their product offerings so very much that we’ve partnered up as an affiliate to bring you guys awesome product deals and treats throughout the year! Clearly honey isn’t keto, but you might be surprised how well some of the natural keto sweeteners work in its place. Note: feel free to honey-it-up if paleo of course! I’m personally having a love affair with allulose you guys, particularly when it comes to savory cooking. Hear me out: there’s no risk of crystallization and its smooth blending (unlike with erythritol), and its zero GI and pup friendly (unlike xylitol). The drawback is that its a little pricey, but hopefully with time we’ll get a better deal. But no probs you can stick to sugar alcohols too (erythritol and xylitol). 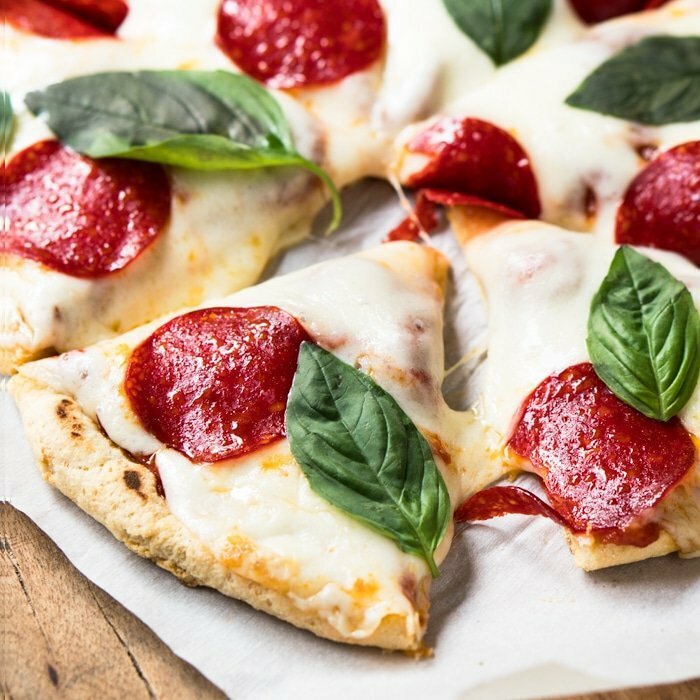 To avoid a grainy sauce with erythritol it must be powdered. So get your blender out, make sure it’s completely dry, and process until powdered. Just make sure you wait a few moments for the dust to settle before opening the blender or food processor. Or you can always grab a bag of Powdered Lakanto or Powdered Swerve (i.e. confectioner’s). In a medium bowl whisk together mustard, sweetener and vinegar. Emulsify the oil into the vinegar mixture: pour in the oil very slowly into the vinegar mixture while whisking rapidly (feel free to use an electric whisk). Begin drop by drop and slowly increase speed into a stream. It should take about 2 minutes to incorporate all the oil. Adding in the garlic and dill is totally optional, but a very nice touch for salmon. Note: the sauce will still work great even if your emulsification fails, just won't be as smooth! Set aside or refrigerate for 3-5 days. Preheat oven to 450°F/230°C. If roasting radishes, pop them in 30-45 minutes before the salmon (depending on size and how well you like them done, see roasted radish recipe for insight). Rinse the salmon fillets and pat dry. Arrange fillets, skin sides down, in parchment or foil. 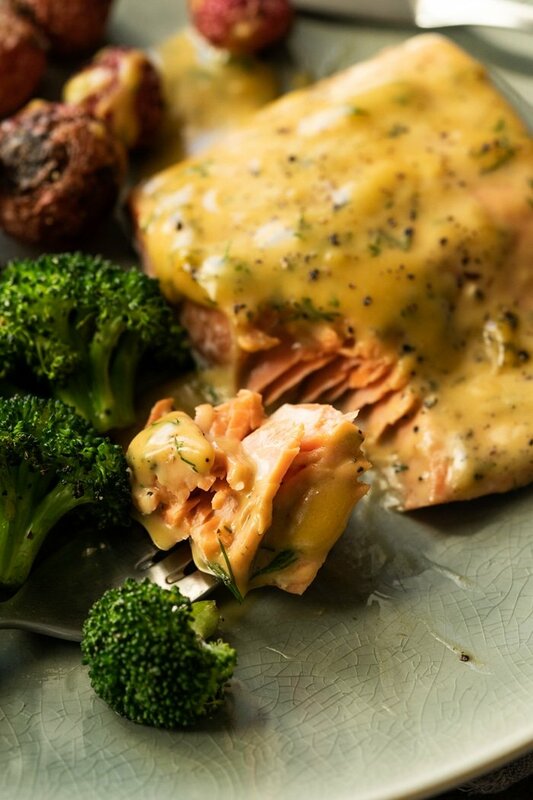 Liberally brush the salmon with the honey mustard glaze. 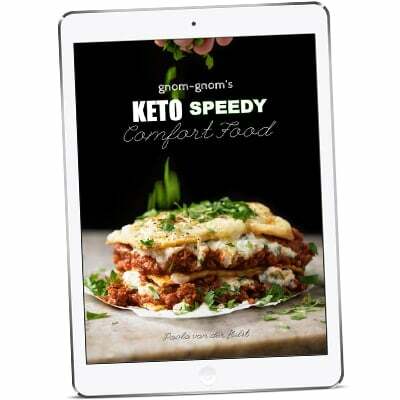 Allow to rest at room temperature for 15 minutes. 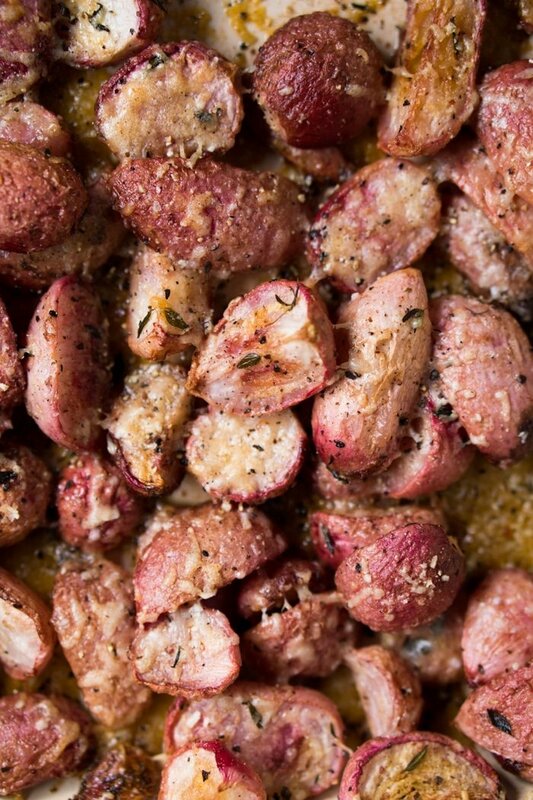 Take the radishes out of the oven roughly 10 minutes before they're done. Add in the broccoli florets, drizzle with extra virgin olive oil and season with salt and freshly ground black pepper. 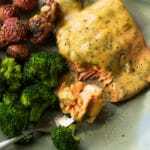 Place the marinated salmon fillets on the tray and bake for 10-12 minutes, or until just cooked through. Serve right away with plenty of sauce! *Note that I like my broccoli nice and crisp, so do feel free to roast it a little longer if you prefer it on the soft side. This was really wonderful too! Want to make sure I understand correctly…tha salmon fillets are placed on the same baking sheet with the veggies; they aren’t wrapped in parchment or foil? It’s like you’re a fly on the wall in my house! Somehow you always know what I need and when I need it Paola! I’m getting geared up for a detox. As much as it pains me to think of doing without desserts and breads temporarily, even keto, you come through like the MVP you are. I just returned from the grocery store after purchasing salmon to make your salmon lettuce wraps. Now look at this! You are insuring that my love affair with cooking all things Gnom-Gnom continues uninterrupted.